A secure password protected login area that protects your database from prying eyes. A downloadable and printable step-by-step manual, explaining all aspects of MantisMail in great detail with excellent tutorials and examples for beginners. Simply enter your details to try MantisMail for free. Once logged in, you can then access all functions of MantisMail except sending a bulk campaign. Once you are ready to send, you can click enter your credit card details to active your full account and start sending unlimited email campaigns! 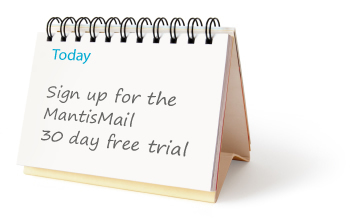 Sign up now for a free 30 day trial and try MantisMail now! The trial includes full access to all features except for bulk sending (you can send yourself previews of emails). This is a great way to try out our editor and see how easy it is to create beautiful email campaigns. MantisMail is an easy to use, yes highly powerful email and sms marketing tool. Using our unique editor, you can easily create beautiful email campaigns to then schedule or send immediately and track with comprehensive reporting.